The American Colors flagship store located just off of State Street in downtown Santa Barbara offers the kind of basic clothing that’s timeless, relaxed and sophisticated without sacrificing fit or that subtle “cool factor”. The brand, established in 1997 by Henry Lehr, has been operated by son Alex and daughter-in-law Shannon since 2003. The couple has continued the family tradition of producing exceptional basics, including shirting, dresses, tunics and t-shirts, in an array of sophisticated colors, while evolving the quality and sustainability of the fabrics. All raw material for American Colors goods is procured in Japan and then cut, sewn, and washed exclusively in the United States. The flagship store carries a variety of other great collections, all complementary to the in-house brand, from companies sharing similar values - sustainability, quality and character. 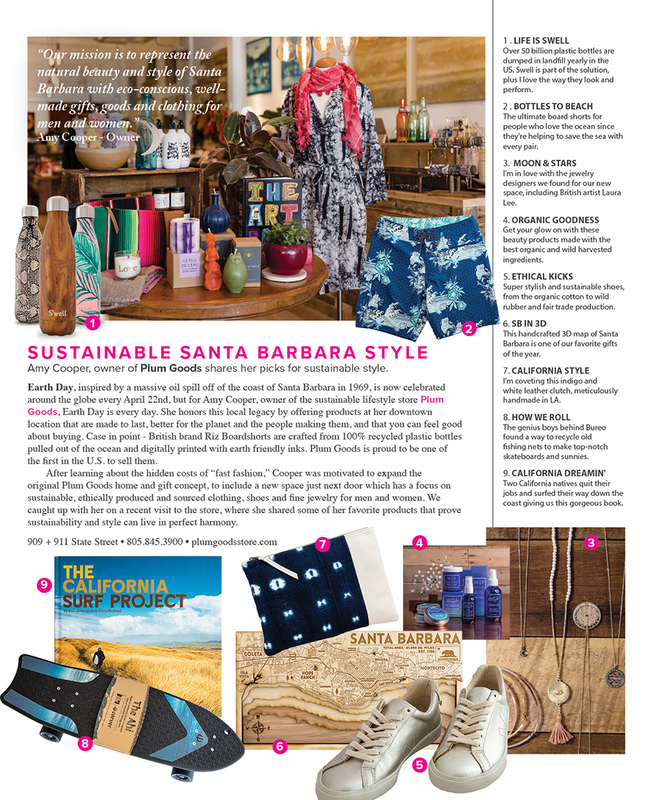 Shop bags from Will Leather Goods, jeans from Big Star Denim, feminine blouses from 0039 Italy, hand-crafted sandals from Beek and jewelry from Santa Barbara native, Marisa Mason and so much more. In a world full of “fast-fashion”, the American Colors’ family owned and run business is a breath of fresh air. The Lehrs both agree, “It’s truly a labor of love for us. We are small and love being small. We love to meet our customers, hear their stories, and enjoy being a part of the fabric of the Santa Barbara community”. 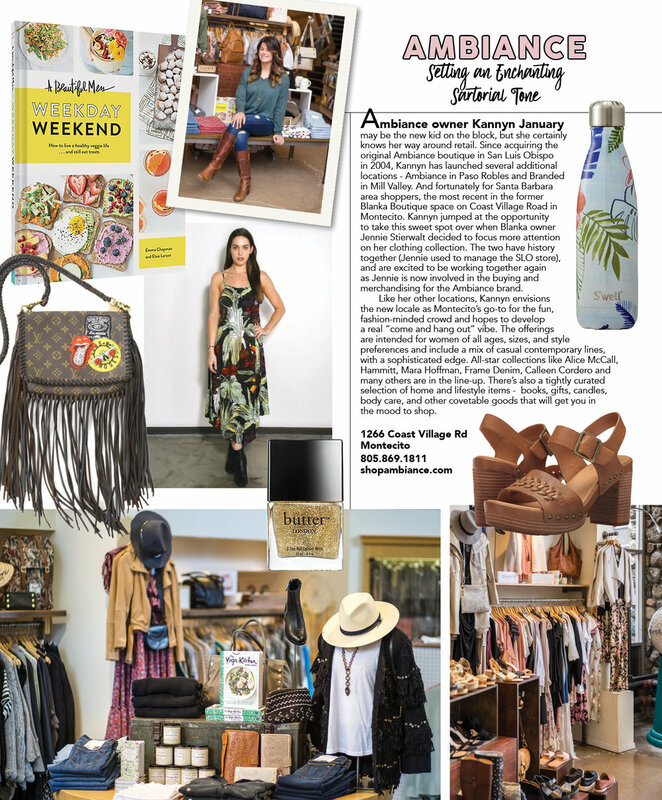 Located on historic Santa Claus Lane in Carpinteria, Rowan is a seaside treasure trove of clothing and accessories that define the casual, yet elegant Santa Barbara lifestyle. The charming boutique, established in 2012, has made a seamless transition to new ownership. Now in the hands of Gina Chadbourne whose dream of owning her own retail space is backed by a long-standing passion for fashion and a solid background in business and sales. Gina is moving forward with the initial vision responsible for building a loyal customer following. “I love the feel of Rowan - the beach vibe and the relaxed shopping experience,” says the new owner who will continue to carry fine quality, unique items, the same well-known brands and collections, plus a few new additions. She is most excited to introduce hot designer sunglasses from Tom Ford, an exclusive in the area. Shop the selection of James Jeans denim, cozy Joah Brown sweaters, luxe lace dresses from Nightcap and more. Also, look for a fresh new website in the coming months, which will allow customers to indulge in little Bohemian beach-style anytime. In a world where fashion is sometimes taken a bit too seriously, Montecito clothing and lifestyle boutique Whistle Club provides some respite. That’s not to say there isn’t some serious fashion here - there absolutely is! For owner Rebecca Blair it’s all about creating an atmosphere where a warm and welcoming retail experience and high-quality merchandise can coexist. At Whistle Club customers can mingle and grab a cappuccino at the in-house Stumptown Coffee Roasters espresso bar while shopping clothing, accessories, and gift items from emerging designers and industry favorites. The designer edit at Whistle Club is constantly evolving. Whether perusing social media, the latest issue of Vogue or scanning the streets of New York City, Blair is always on the lookout for the next great addition to the store’s brand matrix. Looks from Rachel Comey, Horses Atelier, Tibi and Closed are perennial favorites, while Carven, Re/Done and Miranda Bennett are new to the store this season. The curated selection pulls the best from the casual West Coast to the edgier East. If you are in the market for coveted designers and perhaps a little caffeine-induced buzz, make Whistle Club your next stop. 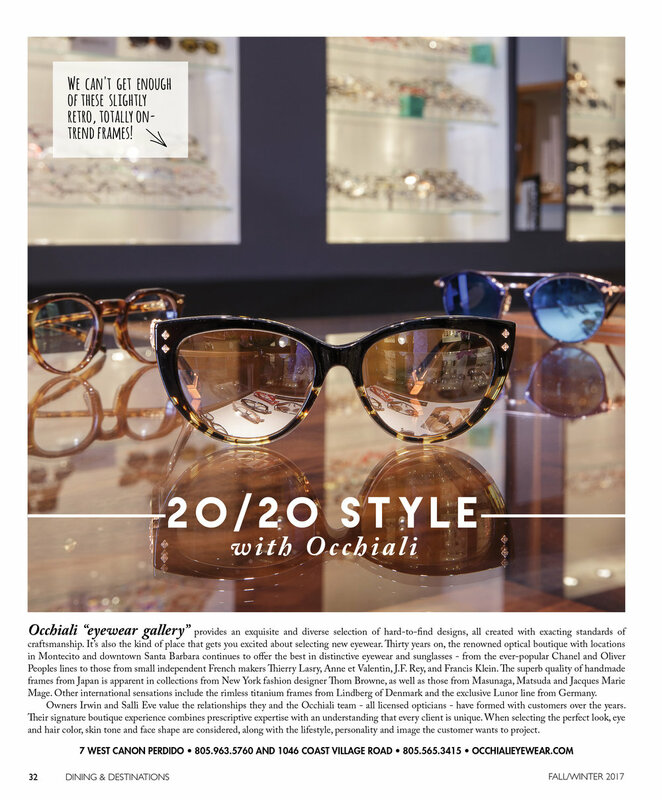 Occhiali is the kind of place that gets you excited about selecting new eyewear. Now in its 28th year, the renowned optical boutique with locations in Montecito and downtown Santa Barbara offers the best in distinctive eyewear and sunglasses - from the ever-popular Chanel and Oliver Peoples lines to those from small independent French makers Thierry Lasry, Anne et Valentin, J.F. Rey and Francis Klein. The superb quality of handmade frames from Japan is apparent in collections from New York fashion designer Thom Browne, and in the Masunaga, Matsuda and Leisure Society lines. Other international sensations include the rimless titanium frames from Lindberg of Denmark and the exclusive Lunor line from Germany. Owners Irwin and Salli Eve value the relationships they and the Occhiali team - all licensed opticians - have formed with customers over the years. Their signature boutique experience combines prescriptive expertise with an understanding that every customer is unique. When selecting the perfect look, not only is eye and hair color, skin tone and face shape considered, but also the lifestyle, personality and image the customer wants to project. Stop by one of their two locations and let Occhiali help you see things a little more clearly.